If you’ve ever visited your local SPCA, you can envision the scene: Crates upon crates of stray cats of every shape and color, all yearning for a loving home, but going largely unnoticed if there are kittens to be adopted (which always seems to be the case). Sure, kittens are super cute – but what happens to the older cats, the ones that are passed over by kitten-seeking adopters? I was recently pondering this question when it hit me: I could create a cats-only adoption website to advertise adult cats looking for a home, where pet seekers could explore an alternative adoption process and find feline friends that are a perfect fit. I would call it something like PurrfectPets.com, and it would brilliantly solve the old-cats-never-get-adopted problem. As I thought through my plan to find every adult feline a human to call its own, I knew WordPress would be my ticket in. WordPress is the software that powers WordPress.com, a popular browser-based website builder. However, you can harness the power of the platform by downloading and installing its software from WordPress.org to build a website hosted by a third-party provider. You can read more on WordPress.com versus WordPress.org here, but in a nutshell, you should strongly consider self-hosting if you want to own and control your site’s brand without ads, you need better technical support, and/or you’d like to leverage premium plugins and tools. Below you’ll find tips and tricks for creating a one-of-a-kind self-hosted WordPress site. What many people don’t know is that web hosting is fundamental to the success of any website. When selecting the WordPress host that is right for your needs, you should evaluate providers for speed, reliability, security, and price. Self-hosting your WordPress site will give you far greater creative control over everything from code and plugins to themes and user experience. If you’re a beginner, you might want to look for hosts that offer a robust technical support program and can help you befriend the WordPress backend. You may pay a bit extra if you go for fully managed WordPress services, but the saved time could be worthwhile. WordPress-specific hosting is among the fastest-growing segments of the hosting industry — but not all providers offer the same attention and optimizations. In addition to the hosts listed above, providers such as Doteasy enable customers to choose just how much computing power they think they need to perfectly balance price and performance. Doteasy has provided high-quality and affordable web hosting for nearly two decades. Doteasy streamlines the WordPress experience for beginners by pre-installing the content management system during the signup process. Customers can choose to configure Doteasy hosting services with or without solid-state drives, and the plans come with a free domain registration — some packages will even cover the first renewal period, as well. Do your research. There are billions of sites already in existence. So unfortunately, your ideal domain may not be available right now. Pay close attention to anything that might be copyrighted or legal property of a company. Your [purr]fect domain name is not worth a potential lawsuit! Keep it short and easy to spell. For example, “PurrfectPets.com” could confuse potential site visitors with its play-on-words spelling – maybe “MeowMates.com” would be a better option here. Do your best to exclude numerals, hyphens, dashes, or any other symbol that might be confusing. Simplicity is your best friend. Make sure your domain name is consistent with the brand you’re trying to build. In most cases, your domain name will be the first visitor touch point, so you want to ensure it’s as closely related to your brand, site name, or business as possible. If MeowMates.com was not in fact intended to be an animal- or cat- related site, I would be better off picking a name that more accurately reflected the site content. Don’t forget about SEO! Keywords in your domain name can help your search results ranking, but don’t overdo it with keyword stuffing – “MeowMatesCatFoodSuppliesAdoption.com” would not be a more successful name, even though it is (over)loaded with relevant keywords. Still stuck? Try a domain generator. There are a bunch of great ones out there that can help get your creative juices flowing. Most of the hosts we recommend include a free domain registration for at least a year when you sign up for an annual plan. Take advantage of these offers while they’re available! So, you’ve purchased your catchy domain name – now you’re ready to make things official! One of the best things about WordPress is its intuitiveness. You don’t have to be a code wizard to get a site up and running, and the download/installation process only takes about five to eight minutes. Once WordPress is up, you can begin publishing content immediately! First, log into your selected hosting service platform and go to cPanel. While the layout of cPanel will vary from host to host, the steps to install WordPress will be largely the same. 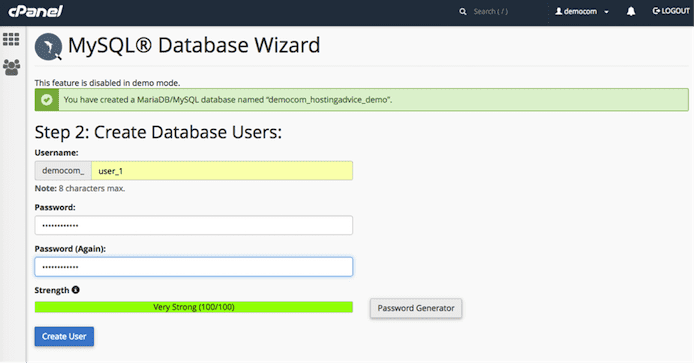 Next, scroll down to the section labeled “Databases.” Select MySQL® Database Wizard. You’re going to set up a database where WordPress will store all of your site data. Most WordPress-friendly hosts will include cPanel, a management panel from which you can install WordPress. 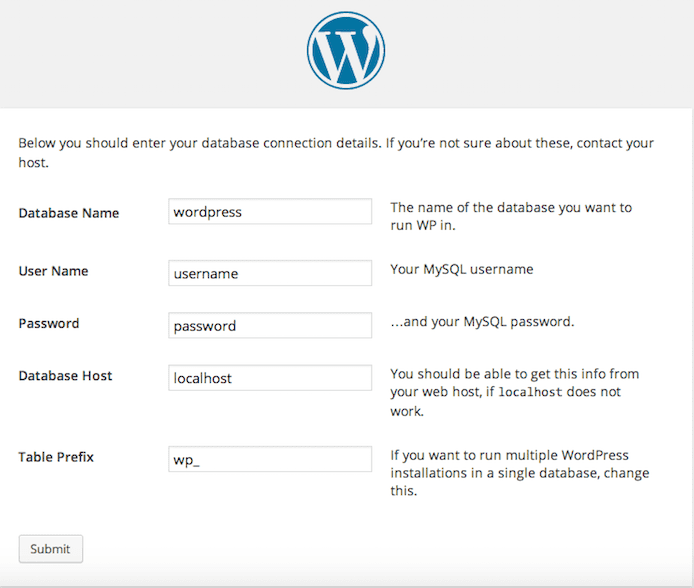 You’ll want to create a database for your new WordPress site. Make sure you choose a strong password for your new database login credentials. Next, you will see the privileges options for the user. Select the options according to what the user will need. If you’re creating an administrative account, you will want to select all privileges. Now we need to give WordPress the details of our database, so it has a destination for our site data. Enter your database connection details as instructed. Voila! You just installed WordPress. Now you’re ready to put the finishing touches on your site. This is where your site will really start to come alive. When it comes to your site’s design, you have two options: Using a pre-packaged theme, or creating a custom design with HTML and CSS. Depending on how comfortable you are with backend code, a theme may be the more enticing option, as it will require minimal technical maintenance on your end. That said, if you want full control over your site’s look and feel (and you have a solid understanding of HTML/CSS), a custom-coded design might best fit your needs. There are thousands of theme options from which to choose, and many are designed for specific purposes. Looking to run an eCommerce site? There is a theme for that. Are you more interested in a creative look, perhaps for showcasing a personal portfolio? There is a theme for that as well. The best thing about themes is that they’re constantly getting updated. We recommend checking out the WordPress Theme Directory to browse the best selection. Distinctive Themes created the uniquely styled Ruthin theme, which features a navigation menu on the left side of the page. 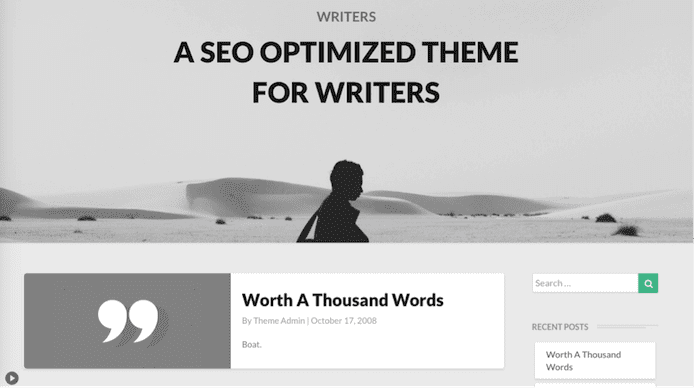 Aptly named theme Writers gives bloggers a leg up on SEO-friendly online content writing. 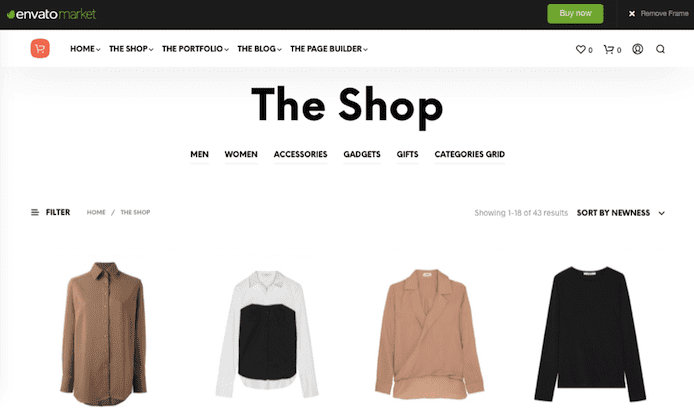 ShopKeeper by envatomarket is great for organizing and promoting your online store’s merchandise. 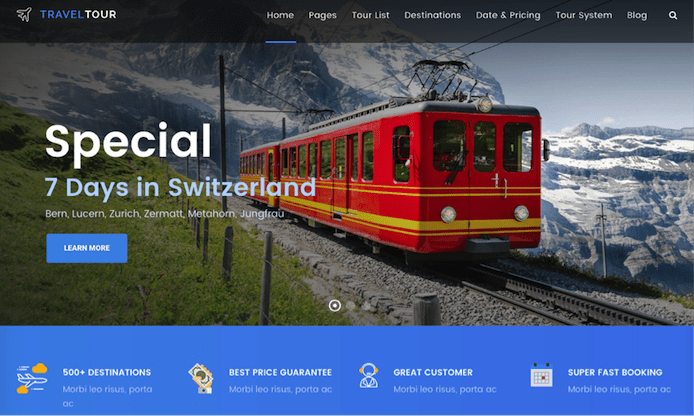 Showcase gorgeous destinations and experiences with TravelTour, an excellent theme for booking sites. If I were selecting a theme for MeowMates.com, I would be looking for something that offered the ability to browse components, search and filter for specific keywords, easily find contact information, and submit secure information forms. You can download and install your theme with a variety of methods. For an in-depth look at Directory, .ZIP Upload, and FTP theme installations, check out our step-by-step instructions here. Download via the Official Directory – This is the quickest and easiest way to install a theme. If you’re using a native WordPress theme, it will only take two to three clicks to get it up and running. Manual Upload via .ZIP – If you’re using a theme from a third-party website, you may have to do a manual upload. You’ll simply upload the theme’s .ZIP file to WordPress, and with a few clicks, the installation will be complete. Manual Upload via FTP – (S)FTP is an alternate way to manually upload a theme. Depending on your web hosting service, you may have to use this option. The upload process itself is nearly identical to the .ZIP upload process. Step 5: Generate Content and Publish! Congratulations! You’ve successfully set up your own WordPress site. Now what? We’ll give you a hint: Publish, publish, PUBLISH! Start sharing the amazing content you’ve generated for your site, whether it’s blog posts, photography portfolios, business specials, or branded marketing collateral. Make sure your content is SEO-friendly, tagged appropriately, and organized logically. It wouldn’t hurt to do a little research on content strategy best practices, either. At the end of the day, you want to ensure your site visitors can find the information they’re looking for as seamlessly as possible. When it’s well organized and easily accessible, great content results in great success. While MeowMates.com isn’t live – yet – I know that when I decide to launch the project, I have everything I need to start connecting lonely cats with their future families. As it turns out, the self-hosted WordPress “learning curve” is really more of a gentle slope – once you learn the basics, the rest really isn’t that difficult! I hope that no matter where your WordPress journey takes you, you create the purrfect site for your needs. And your host will be with you every step of the way!